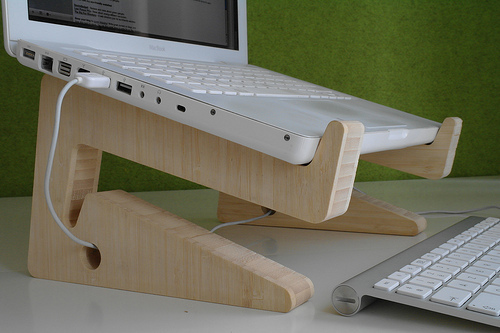 The Puzzle Bamboo Laptop Stand allows you to use a laptop at a better height when at a desk. The stand raises the laptop to eye level while offering great ventilation to the base of the laptop to prevent overheating. 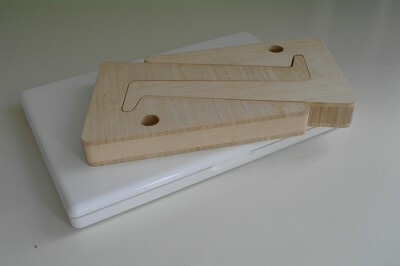 The Puzzle laptop stand is made from bamboo wood. The shape of the stand was envisioned to use the least amount of material as possible, to allow it to be made out of the small left over pieces of bamboo from making larger items. The design allows the two parts of the stand to be interlocked to create an easily transported and flat item that should fit into any good laptop bag without a problem. This allows the stand to be taken wherever you need it, to offer you a better height of laptop use when you are out and about without adding too much extra weight or inconvenience. The Puzzle Laptop Stand is made from bamboo, there are many advantages of this environmentally. Bamboo grows very quickly so makes a good renewable wood alternative. Being a type of grass, bamboo takes carbon dioxide in to grow like all plants, trapping it within itself to only be released when the material is burned. For the stand the maker takes bamboo from the manufacturer Moso who try to operate in an eco-friendly manner, for example they use a glue with low formaldehyde. As the stand comes in two separate pieces it can be used by a wide range of sizes of laptops by simply positioning the stands at the distance apart required. This separate nature does mean the stands can be used for more than just as a laptop stand, the ends can be used as book ends, or even as heat mats for pans.